Game Introduction – Epic Conquest Is A New Action RPG Single Player Game, With Traditional Design Developed By Gacon Games. 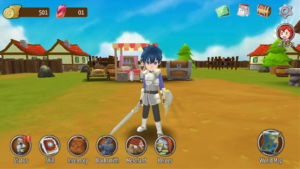 In This Game, You Protect Innocent Villagers From Monsters With Your Special Skills. The Game Has Three Playable Characters And You Can Choose Any One Any Time. 1.) Edna – A Cheerful Witch Who Travels The World To Find Her Long Lost Brother Who Had Fallen To Darkness. Edna Is A Flame-User With Ultimate Destruction Power. She Specializes In Long-Ranged Nukes And The Ability To Charge Her Spells To A Higher Tier. 2.) Alaster – A Loyal Knight Of Alliance. He Swore To Exterminate All Demons And Return The World’s Peace. Alaster Is An All Rounder Fighter With A Good Balance Of Offensive And Defensive Powers. He Excels In Countering Enemy Attacks To Gain Power Boost. At Starting, You Play As Edna And Learn The Basic Of Them i.e. Game Controls, Monsters. After It, You Play As Loyal Knight “Alaster”. Your Goal In This Game Is Kill All Demons With Super Skills Of Your Player. Attack – Taping On It Will Release Fire Ball(Edna).If You Play As Alaster You Attack With Sword. Run Away/Fast Run – Taping On It Will Move The Player Fast. Defense – When Demons Start Attacking On You With Their Weapons Then Use Defense Option. Fury Mode – Use This When You Are In Trouble i.e. When Demons Are Large Or You Are Fighting With Boss. At Last Of The Level, You Will Fight Against Powerful Monster. Use Fury Mode, Fast Attacking Mode To Win The Fight. Traditional Design Of This Game Is Excellent. Collect Gold, Ruby, Xps After Your Kill Demons. Stats – This Section Shows You Player Skills And Level. Skill – Know The Player Skill. Inventory – Equip Weapons That Suitable For Your Character. Blacksmith – Upgrade Inventory. Merchant – Buy Meals, Gold, Ruby Etc. Heroes – To Change Player. You Will Earn Reward Like Gold, Ruby, Souls, Potions On The Basis Of Your Attendance. You Can Play This Game Offline. No Internet Is Required To Play This RPG Game On Your Android. However, To Claim Rewards, In-App Purchase Internet Is Required.